Simple enough concept - the aim of the game is to drive your red racing car through the maze into the rooms and collect all of the moneybags and chequered flags before your fuel runs out. 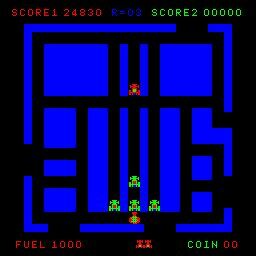 You must also avoid the bombs and the little alien located in one of the rooms, which slowly roams the maze, and will kill you on contact. You are pitted against green enemy cars whose sole aim is to crash into you and deprive you of one of your three lives. Lose all of your lives and the game is over. The whole screen consists of a large map containing 16 rooms. When you are outside of a room, the whole area is visible, but when you enter one of the rooms, the game zooms in so the room fills the whole screen. You are provided with symbols which show you the contents of rach room, so that you know where the moneybags and flags are located. The moneybags are denoted by yellow squares, and the moneybags by small yellow checked icons. The position of cars is shown onscreen by a white square. 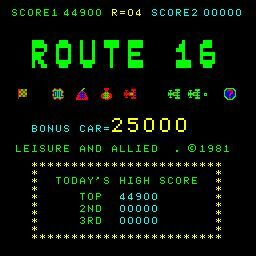 You are awarded points for collecting the moneybags and when you collect a chequered flag, the music changes and you are able to kill the enemy cars which turn into moneybags for as long as the music plays. The points double for each opposition car destroyed, but as soon as the music stops they are back chasing you again. The moneybags also transform into oil slicks and back again, and if you collect a slick, not only do you not score, but you are also slowed down for a few vital seconds. All the while you are roaming the maze, your fuel level slowly drains. You can use the fire button to boost your speed while it is held down, but this drains your fuel level much faster and should only be used in limited bursts. As the game progresses the number of enemy cars increases making your task that much harder. An extra life is awarded for 25,000 points. Enemy cars: 200, 400, 800 points etc. End of level bonus: 10 points x remaining fuel. Remember that the biggest score available in the game by far is for the remaining fuel at the end of a level, so use your turbo boost sparingly and not at all if possible. When in a room with a chequered flag, try to lure as many of the enemy cars in as possible before getting the flag. The enemy cars automatically flee when they turn into money, so you need them grouped. 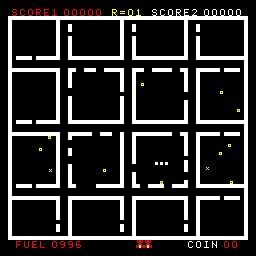 When aiming to collect the money surrounded by the four squares, note that the first square turns the money into a bomb, so collect a second square before grabbing the money. Since the 12 outer rooms only have one entrance/exit, try and sneak in there when the opposition is furthest away, so that you can get in and out before they close in on you.